Forget the kitsch fridge magnets and cliched t-shirts. At Hellofrom you'll find a range of useable and wearable items that you will cherish every day. The claim on the storefront of hellofrom Thessaloniki- “Making great things since 3200 BC”- is actually completely reasonable in Greece. Inside, we find the latest chapter: a dynamic hive of synergies and designs that embody the things we love about Greece – authenticity, creativity, and style combined with a lot of heart. 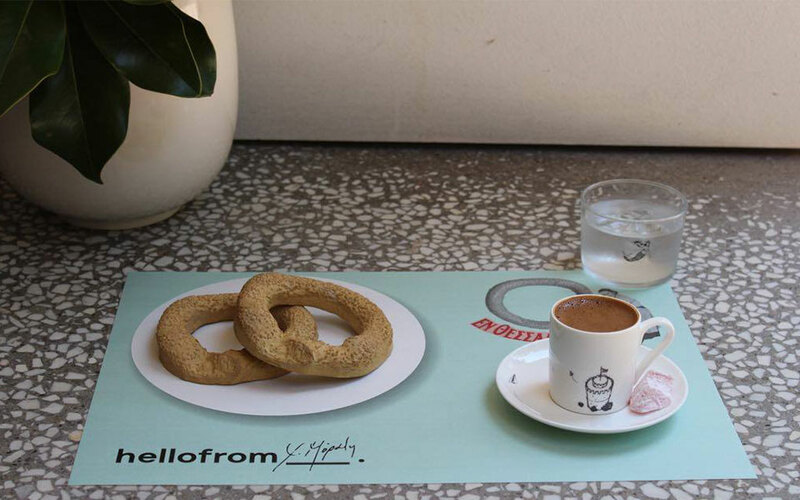 The first thing I lay eyes on brings a smile to my face: a koulouri – the sesame bread ring that is Thessaloniki’s favorite street breakfast, immortalized in ceramic by artist Christina Morali. It is as likely an icon as Andy Warhol’s cans of tomato soup, but way more delightful. The place oozes nostalgia, whimsy, and above all, authenticity; these are objects that capture something unexpectedly, truly Greek. And they do. Playfulness replaces kitsch, and the intimate replaces the ubiquitous. Every object in here reflects a genuine experience and memory. 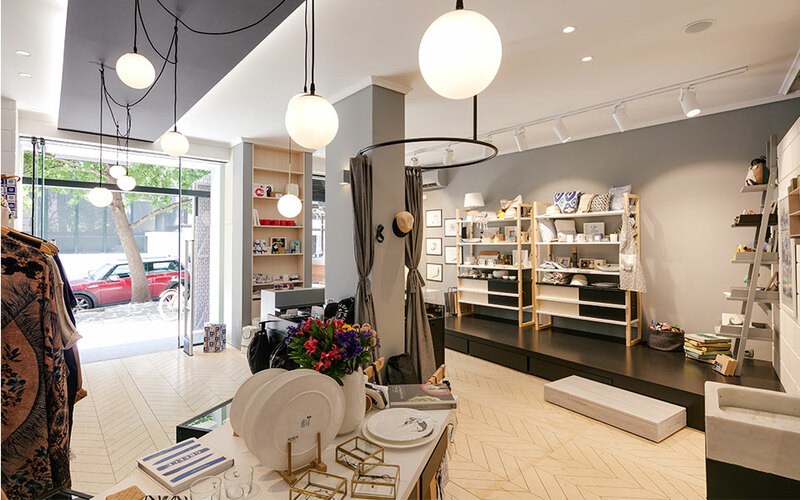 The Thessaloniki pilot store is an experiment in capturing the essence and personality of a specific place. Hellofrom seeks to showcase the work of artists and designers who have something unique to say about Greece, about Thessaloniki. 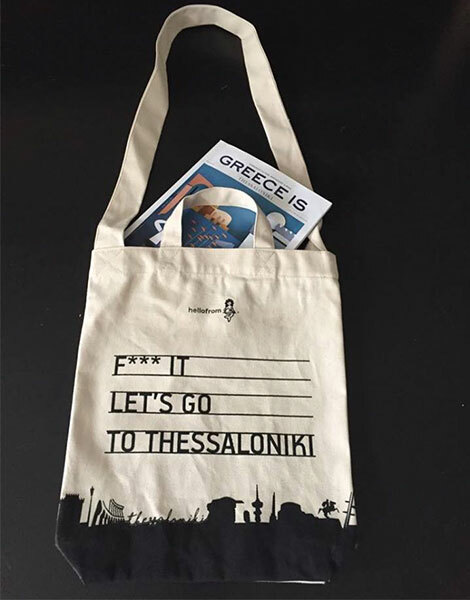 More than 70 designers are now involved, and through these collaborations over 100 uniquely expressive souvenirs of Thessaloniki have been created. This is not really a business concept – although it would be a good one. Hellofrom is more of a vision. Roxani reveals that Konstantinos studied graphics and design, and he designs many of the hellofrom Thessaloniki pieces (and they really are from Thessaloniki – they’re even made here). But he modestly waves away the formal qualifications. That meaning is often very personal. 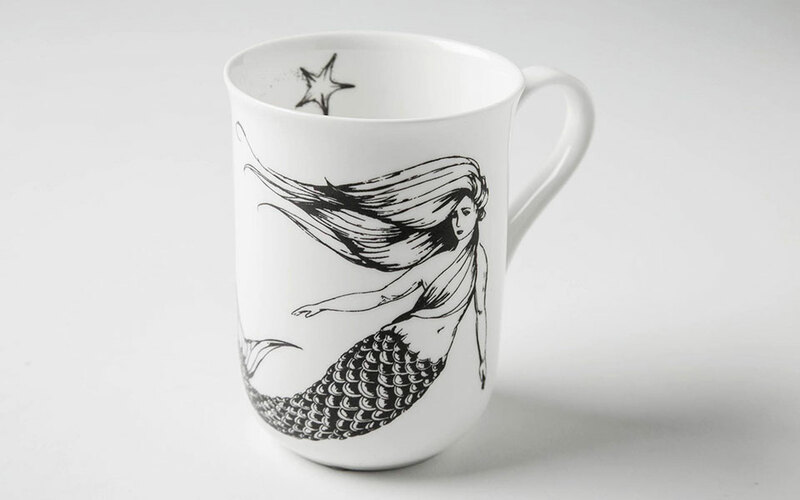 Greeting cards, drinking glasses, and cups carry the image of a mermaid – the symbol of the city. As it turns out, this is not just any mermaid, but the poignant intersection of myth and nostalgia: Thessaloniki, as many know, is named after the young sister of Alexander the Great, the wife of Cassander who founded the city in her name. In mythology, Alexander washed her hair with water from the fountain of immortality. When he died she jumped in the sea in grief, but instead of drowning, she became a mermaid. 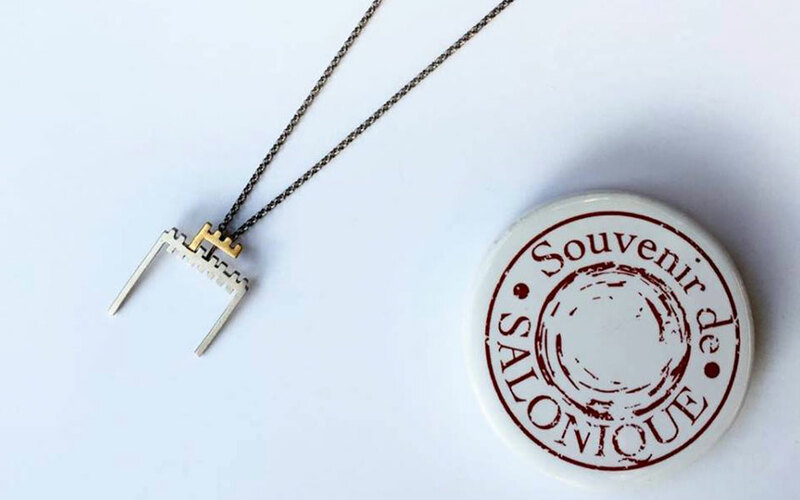 Truly, this is the souvenir store you have been waiting to find, offering usable, and wearable, pieces that are profoundly – yet discreetly – connected with a sense of place. Redefining the souvenir t-shirt is one in black, impeccably cut, silky in 100% natural Tencel (an eco-friendly material made from eucalyptus trees). Designs capture aspects of the Greek experience – a velvety black imprint shapes an abstracted “θ” for Thessaloniki; another design is based on ancient jewelry found near Vergina. 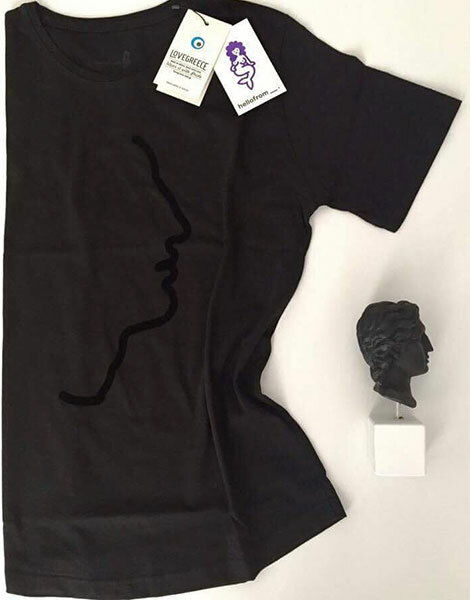 There’s even the black on black yet unmistakable profile of Alexander the Great (“Actually, lots of people notice a resemblance to Sakis Rouvas” Konstantinos says). The shirt’s hanger is just as nice; made from burnished wood and metal with a top shaped like a rooster, it is a sculpture in its own right, the product of a new collaboration with Dimitris Kalergis, an architect from Volos. More wearable Greek art is represented in the Greco-elegance of the prêt-à-porter pieces of Angelos Bratis, and the gold and marble jewelry of Marmarometry (by Xenia Nefelly Vlachou). There are select pieces from the legendary label Parthenis, from Studiomateriality (fabulous silk scarves that come in equally fabulous packaging), and more excellent jewelry. This is also the only place in Thessaloniki where you can find certain quality brands. 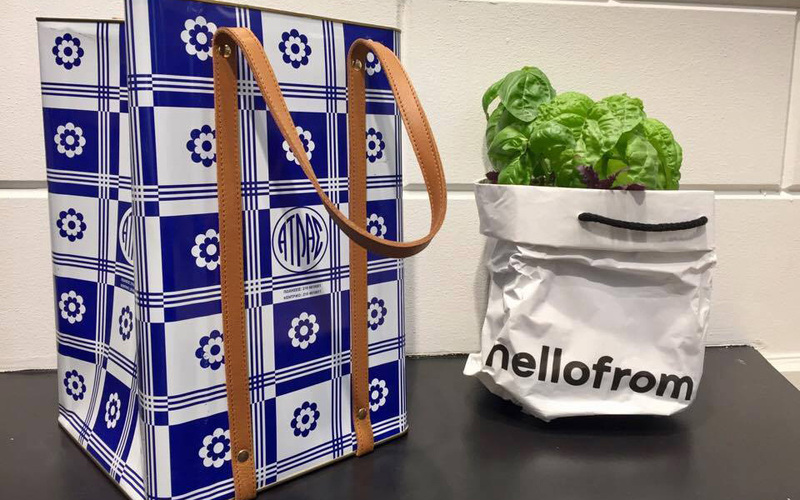 Lovegreece, for instance, is exclusively represented in Thessaloniki at hellofrom (and it really does love Greece – 100% Greek cotton, 100% Greek labor create stylish signature bags and shirts). 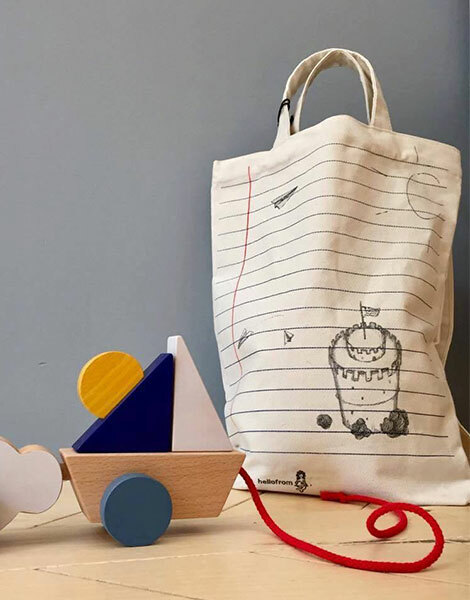 The same goes for Salty Bag, who offer something more than elegant upcycling – with your bag or pillow comes the story of the sail it is made from and the voyages it’s seen. These are objects with identity, with a meaning and a whole back story of their own. 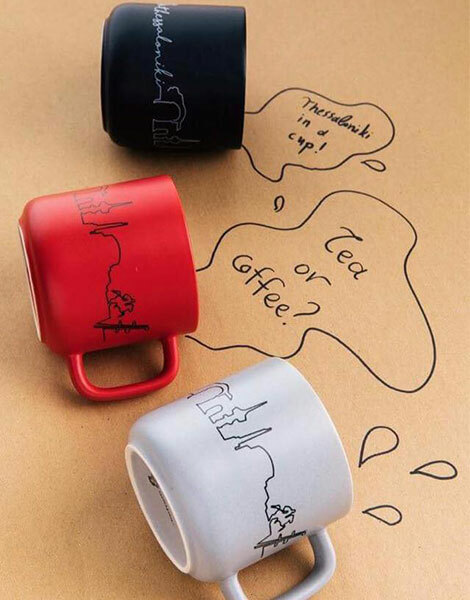 “The word ‘souvenir’ had become so tainted with tawdry, inauthentic associations – like magnets of Cycladic windmills with the word ‘Thessaloniki’ on them – so at first we shied away from using it ourselves.” They’re taking the word back now – redefining what a souvenir can be by offering objects full of meaning, rich in associations. Hellofrom’s inspired, creative work has just been recognized with a bronze award for logotype and logo application from Ermis, an institution celebrating creativity in advertising and communications in Greece.